A versatile travel map bag constructed of rugged unwashed canvas. Features a front organizer pocket, inner divider, outer flap with double snap closure, adjustable shoulder strap, and a convient sturdy hard back. 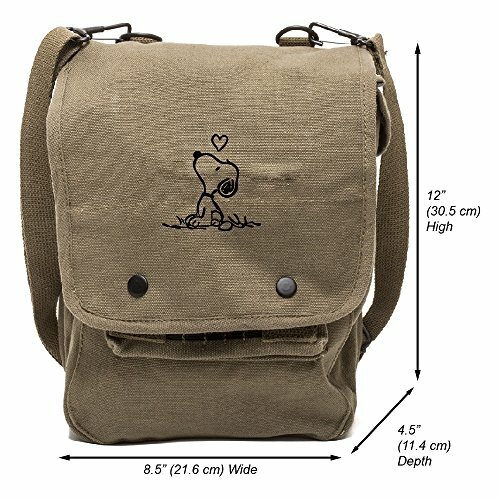 A perfect small bag, great for hiking or traveling. Convient space for small personal items, like wallets, pens, phones, ipad, or small accessories. Dimensions: 12" x 8.5" x 4.5", weighs under 2 pounds. GREAT EVERYDAY BAG: Spacious Front Organizer Pocket, Inner Divider, and Outer Flap with Double Snap Closure for extra security. Great for organizing personal items, like wallets, pens, phones, iPad, magazines, notebooks, or small accessories. PERFECT MULTIFUNCTIONAL DESIGN: Use as a Backpack, Hiking Daypack, Travel Bag, and much. Great for school, carrying art supplies, hiking, camping, traveling, work, shopping, leisure; perfect for students of all ages men, women, teens, girls, and boys. INNOVATIVE DESIGN FEATURES: Comfortable, wide, adjustable shoulder straps designed for comfort during long wear promising not to weigh you down! Top flap keep your valuables safe and secure while you're on the go. Bag measures 12" x 8.5" x 4.5"
If you have any questions about this product by Grab A Smile, contact us by completing and submitting the form below. If you are looking for a specif part number, please include it with your message.